Chemotherapy for cancer and other illness is so hard for everyone to accept and live with each day. The loss of hair during chemotherapy only adds to the difficulty and can cause a lot of anxiety in those who are very concerned about their looks. With our lifestyles and jobs, we strive to feel and look normal during the treatment time. Our motto is “You take care of your body, and we’ll take care of your hair!” Our Chemo Wig is made from soft materials like silk and thin fabric which minimizes the irritation of the scalp that chemo can cause and is designed to stay in place comfortably with a material around the hairline that is made from non-slip polyurethane. 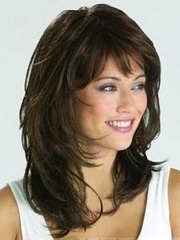 Our Chemo Wigs come in different sizes for the best fit possible and available in dozens of colors. The length of our wig is 16″ long with a natural wave, and best of all it is a stock piece that can be delivered in 2 days! That is such a comforting thought when urgency strikes! Call and come in for a private consultation and fitting!